This is Category One, an absolute Must Change ASAP. The irony here is that not five minutes earlier, I left the Shaler Library, where I attended a meeting on making biking safer in Shaler. Mount Royal Blvd, northbound, just past the corner of West Shaw. In case it isn’t obvious, my kickstand is up, and the bike is being held upright by the front wheel which is fully captured by the leftmost slot. I will say again what I said in 2008: They’re all over the place, and will not get fixed until they get recorded and reported. I’m up and down the same roads every day, but don’t often get into uncharted territory like this. If I can find a new-to-me one this fast, how many more are still out there? 2 on uphill section of one wild place. Will obviously be in the bike lane when the lines are drawn. Can you get photos, please? If this has been reported before, I am not aware of it. Directly in line with the path of travel from the access point to the 16th St Bridge from the North Shore Trail, at the corner of River Ave and Chesbro Street. Tagged the 311 folks on it, too. That’s two I’ve found in a week, just by going a bit out of my way. Eight years I’ve been after these! You’d think I’d’ve run out of new ones to find! Couldn’t snap a pic because I was in the car but not only are there 2-3 longitudinal drains on the uphill climb of One Wild Place, there are two on the downhill. If someone could snag a pic that would be great. Can’t stop to take a pic in a car and rarely if ever bike up that way. Anytime I go through a new-to-me section of town, I find another one of these. In this case, four, one of them in precisely the wrong place. The first of these is at Spring Garden Ave at Vinial. If you are making the left turn, this is lined up perfectly to eat your bike. The second of these is at curbside just before that, but I nearly fell into it (shown) while turning around to get the first. The third photo shows two of them on the sidewalk in front of the Deutschtown Fire Hall, only a couple hundred feet away from the first two. A kid riding on the sidewalk could easily fall into one of these. I saw more, but did not stop to photograph. At least two are on Concord, interspersed with the loose bricks and the trolley tracks. And I wasn’t even looking that hard. Didn’t read this whole thread, but I know there is one between the rankin bridge and the waterfront enterance. Gotta remember to take the lane there. It’s after the merge with the traffic coming from Kennywood. All in all, not the safest stretch of road. I recently suffered a serious injury while biking in Greensburg. 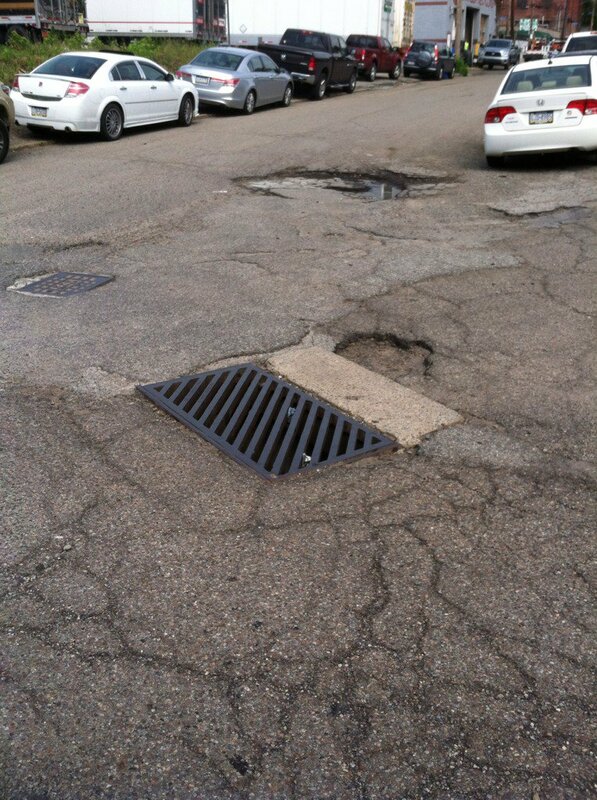 As I was pulling out to Main Street, my front wheel fell into a hole in the grate of a catch basin. I flipped over onto the pavement, shattering my elbow and hitting my head hard (requiring CT scan). I thought that was the ball game. Some kind Samaritans carefully moved me to the sidewalk, where I waited for the ambulance to take me to the hospital. I had surgery to repair the displaced elbow, which required a metal plate and pins installed in my arm. Though the surgery was successful and the physiotherapy helpful, I still have a permanent deficit in my arm’s range of motion. I do not believe that such an accident was a fluke. I believe that these catch-basin grates pose a serious hazard for bikers navigating city streets. I wrote this to warn other unsuspecting bikers who ride their bikes on the streets of Greensburg. These grates can be found on most streets, and the holes in the grate are wide enough for a bike tire to fall into. Very sorry that you were hurt and I respect you letting others know about the grates but, it’s your responsibility to judge the safety of your intended path. Always be aware, not “unsuspecting”. We don’t need a push to replace the grates. My guess is that if there was a pothole in the lane of travel big enough to damage her car this commenter would be storming the gates of the city, county, state to get it fixed. We DO need a push to replace grates like this. This is the bicycle equivalent of a pothole three feet across and 18″ deep. If you hit a hole that big with your car, and reported it, PennDOT or whoever would be on the scene in less than an hour to patch it. Grates like this are dangerous by design. Replacing one would likely cost about as much as a “rough road” road sign. One more thing to consider: Most of these are on the edge of the road. The best way for a cyclist to avoid them is to get squarely in the center of the lane, and stay there. This applies to two-lane roads, as well. Your job as a motorist is to expect, tolerate, and respect this choice, which is fully in keeping with state vehicular law. Paul H also added a reference to the April 2016 case of a woman getting her leg trapped in one. This one is in West View. While it is not likely to catch a road cyclist, a kid cycling along next to a parent, or someone in a wheelchair, is going to have a problem. The curb cut lines up perfectly with the slots for the crosswalk. Perry Highway at Chalfonte, northeast corner. Decatur at Manhatten, perfectly lined up for a cyclist on Decatur. Taking a step back, I have to take a look at the bigger picture here. This thread is over eight years old. Some have been fixed, most have not. Anytime I get off my usual paths of travel, I find a new one. As the man in Greensburg demonstrated, you can get seriously hurt on these. In short, this needs to be somebody’s to own this. Find them all, categorize for seriousness, figure out who owns each, arrange for replacement, arrange for funding, then assign the work. Bids, union requirements, whatever, whoever, I don’t care. Just fix the damned things, and have it all done by the start of the 2018 season. By the 10th anniversary of this thread in October 2018, we can have a big celebrationn about really having made the streets safer. Remember Service Request #74652, the River at Chesbro grate? (Scroll up, this page.) Unchanged in six months. Reported May 31. I confirmed with PWSA that these should all be reported to them. Twitter works well: they’re @pgh2o. Essen at Gershon, North Side. Someone following the rules precisely will have no problem. The person doing something slightly odd, such as a kid riding against traffic across the intersection, could drop right in. This design is common, and most places, you can get away with it. Places like this, what should be a quiet neighborhood, a T intersection at a stop sign, is inherently dangerous precisely because of these. That nobody is falling in them is because of the inherent danger that helps keep kids, and everyone else, off their bikes at all. Get rid of these reasons not to ride, and more people will ride. Third time’s the charm? After being reported in 2013 and twice this year, the latest in November, my May report seems to have gotten some attention. @bus15237 W/O# 6963178 ON OUR INSPECTOR'S LIST THANK YOU. Only took 6.5 months… To get put on the inspection list. There are at least two drain grates in both directions (uphill and downhill) which have the grates in the direction of traffic. This is dangerous for bicycles who are trying to keep over to the side but run the risk of getting their tires stuck in the grates while riding. Closing Comments W/O 653085 ON OUR INSPECTOR’S LIST THANK YOU. Thank you for reporting this, it has been assigned a work order number and will be addressed. If you have any questions please email info@pgh2o.com. or, it was already on the list but they only just got around to responding to your particular ticket. not great either way, though. Well, I’m sure they’re out inspecting today. And if not, tomorrow. And it’ll be fixed by Monday. They’re making sewers great again. Found another one in a perfectly nice biking neighborhood. Three grates over the four corners, this is the only troublesome one. Murray at Northumberland, Squirrel Hill. I have found some in Aspinwall. Field Ave. between 3rd St. and 2nd St. View from field parking on the right. Western Ave at 2nd St.
Across Freeport Rd. from Eastern Ave. (Sunoco gasoline station/convenience store). Of those three, the third is worse than the other two. None of the type with big, gaping slots are OK, but in the first two cases, the chances of someone encountering them at the right angle to be dangerous is minimal. The third, I can easily see someone traveling straight at the camera from that traffic lane, and there it is, lined up perfectly to swallow a wheel, whole, and throw the rider. Go back to page 3 of this thread, and find my post from Oct 16, 2010, in which I try to categorize the various types. I name six in that post, and a seventh a few posts down. I think what I need to do is finish the project I started a few months ago of indexing, geolocating, and categorizing them. I know I had over 100, and we’ve found many more since. Just walked by the field Ave drains. I think they aren’t dangerous. One is right in the middle of the road (easily seen and avoided) and the slots are 45 degrees to the direction of a wheel. And the one off to the side is on the left side of a one way road. I don’t think Aspinwall will do anything about those and they may then blow off the more important one outside of the Sunoco. Remember Service Request #74652, the River at Chesbro grate? (Scroll up, this page.) Unchanged in TWELVE months. Reported May 31, 2016. The above text was copied from my November 28, 2016, post. I find that they respond to only 75 percent of my requests on the website and some are never resolved. I can’t go six months without finding another one of these. This one, well, these three, are in Sharpsburg, a town I had never properly investigated by bike, despite it being just off my usual path of travel. Main and 8th Street, on three corners. I have a spreadsheet on some computer I own, listing every one of the 100-ish grates mentioned on this board since Oct 2008. Some have been fixed, some haven’t. Some are in PWSA’s area, some are not. I will commit to finding that list and making it public. Maybe someone(s) can help with geocoding the locations, mapping them, and ascertaining their current status. One thing that isn’t ours to do is know what’s PWSA’s area and what isn’t. Just find ’em, get ’em listed, and only then figure out who to call to get ’em fixed. I have a separate gripe about grates that were reported years ago, or reported multiple times, which haven’t been touched.